If you’ve got a dog, you’ll know how much our furry friends love to be outdoors. Here, Nicky Roeber, the Online Horticultural Expert at Wyevale Garden Centres, shares how you can use pet-friendly sensory elements in your garden for a happier, healthier pooch. As any dog owner knows, it’s important to provide your pet with an outside space where they can run around and burn off excess energy. A bored dog can become anxious and destructive, so ensuring your pet has plenty of sensory stimulation and lots of things to do will help keep them happy, healthy, and entertained. If you want to add some sensory features to your garden, but you don’t know where to start, then just read on to learn more. Dogs explore using their sense of smell, so be sure to plant some highly fragranced flowers to give them plenty of interesting new scents to enjoy. Sweet alyssum, honeysuckle, and dianthus are all beautifully perfumed plants that both you and your dog are sure to enjoy. If you have an anxious pet, try planting flowers with naturally soothing aromas, like lavender or jasmine. Choose your flowers with care, as some varieties can be poisonous if eaten: you can find a list of which plants to avoid in this guide from the Kennel Club. While dogs depend on their sense of smell, they can also benefit from features that stimulate the other senses, too, so don’t forget about sound and texture. 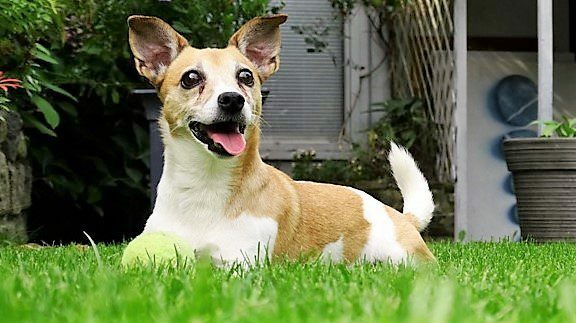 You can vary the range of textures in your garden by adding some new floor materials: gravel, sand and tree bark will all give your pet something different to play in, and they’re easier to maintain than turf. If you want to add a few unusual sounds, then try hanging some wind chimes or adding a small running water feature, which will give your dog some new noises to investigate. Long ornamental grasses, like Chinese silver grass, will make a soothing noise whenever the wind blows, and your dog can also have fun hiding and playing in them. Plus, these features are sure to make your garden, even more, relaxing for you, too. If you’ve ever noticed your dog eating grass during walks, then don’t worry: your pet is actually just self-medicating. Dogs will instinctively self-select edible plants and herbs to help treat minor ailments or moods, and your furry friend’s keen sense of smell can help them to seek out the best plant to treat a particular problem. If you want to help your pet self-medicate, try planting a choice of edible plants in your garden so your dog can help themselves whenever they need to treat minor illness. Meadowsweet is supposed to be good for your dog’s digestion, while valerian and wheatgrass are thought to soothe nervous or anxious pets. You can find out more in this guide to pet-friendly plants and herbs from The Whole Dog. In addition to plenty of exercises, dogs need mental stimulation to stay happy and healthy. 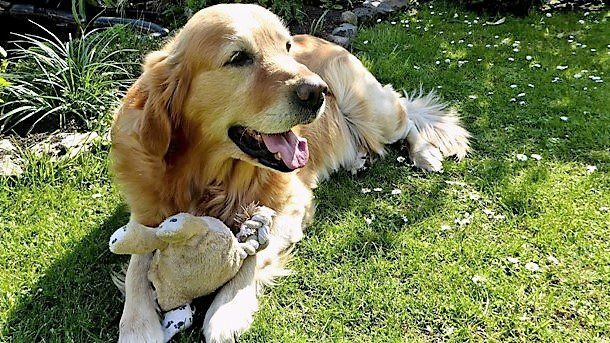 Without enough to keep them busy, dogs can become destructive and anxious, so try scattering a few fun toys around your garden to keep them mentally and physically stimulated. If you’ve got a particularly boisterous dog, and you find that they tend to chew through their toys very quickly, then look for toys that are specially designed to be long-lasting. During the summer months, dogs can struggle to regulate their temperatures and keep cool, putting them at risk of life-threatening heatstroke. You can stay safe by providing a paddling pool, which will give your furry friend a much need place to cool off, as well as a place to play. Bear in mind that your pet should always be fully supervised when using their paddling pool, so only fill it with water when you’ll be there to keep an eye on them. Digging is a natural, instinctive behaviour that dogs will do to relieve stress and boredom. They will also dig to shorten their claws, and certain long-haired breeds, like Chow-Chows or huskies, have even been known to dig holes to help them stay cool during hot weather. Nonetheless, it can still be annoying when your dog messes up the flowerbeds or turf during a doggy digging spree. So why not provide your pet with an area of earth or sand, so they can dig whenever they like? A raised flower bed or children’s sandpit filled with soil will give your dog a chance to display their natural behaviours without messing up your garden: try to find a style with a cover, to keep out rain and cats. If your dog needs some encouragement to use their new digging area, then try burying a few treats to get them interested.